↑ "International Day of Peace Event Information". Secretary-General of the United Nations. http://www.un.org/en/events/peaceday/index.shtml। আহৰণ কৰা হৈছে: 18 July 2013. 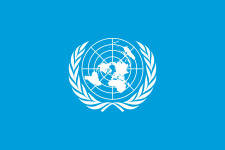 ↑ "Secretary-General's Message on the International Day of Peace 21 September 2002". http://www.un.org/events/peaceday/2002/sg210902.htm। আহৰণ কৰা হৈছে: 2008-01-06. ↑ "UN International Day of Peace", Retrieved on 17 September 2016.